The heavyweight of the New Westminster Salmonbellies defence, Dave ‘Buck’ Marshall started playing lacrosse in 1902 with the New Westminster West Ends in the local city league. He appeared in some senior amateur matches as early as 1904 but his last full season with the West Ends would be 1907. He joined the senior team during the 1908 season when the Salmonbellies required some youngsters to make the jump and help fortify their roster due to crippling injuries incurred by the team after their successful challenge against the Montréal Shamrocks for the Minto Cup. Marshall’s first full professional season would come in 1910, having joined the team on a permanent basis in the later half of the previous season. He developed into a mainstay on the defense playing alongside Salmonbellies captain Tommy Gifford. He played one season in Ontario when he signed with the Toronto Lacrosse Club (also known as the Torontos) of the Dominion Lacrosse Union in 1912. Winning the league championship that season, Marshall was planning to return to the Torontos for the following season but the Salmonbellies management also demanded his services, so the eastern club relented under pressure and released him. On his return from Ontario, and with Gifford retired from the playing field and now managing the team, in 1913 ‘Buck’ Marshall paired up on defence with easterner Johnny Howard. Combined with ‘Bun’ Clark backstopping them both in goal, the trio became a formidable and impregnable defensive wall against their Vancouver opponents during the next three seasons. His usual position was as the point or coverpoint man, the two deepest defensive players on a field lacrosse team back then, although Marshall still managed to score the occasional goal here and there – including an incredible hat-trick on July 31, 1922. While his penalty totals and minutes may seem rather high, statistics don’t paint a clear picture on account of his lengthy career compared to other equally or more penalised players with much shorter careers. Considering the roughness of the game back then, ‘Buck’ was if anything a restrained defenseman with an average of just 2.45 minutes sent off per game in an era when most penalties were doled out in generous 3 and 5 minute increments. That didn’t mean however ‘Buck’ backed down when the play got rough, as he managed to have a few dust-ups over the years – such as the penalty-riddled match of June 26, 1915 when Marshall was tossed out of the game with 55 penalty minutes logged to his credit after a scrap with George Roberts of Vancouver. But keep in mind that back then, when a player was thrown out of a game, he was penalised in minutes by how much time still remained in the match. A total of 338 minutes of penalties between both teams would arise from that bitter contest, which saw 4 Salmonbellies and 2 Greenshirts – including goalkeeper ‘Boss’ Johnson – sent off early and both teams playing short for the rest of the game as only 15 players remained on the pitch for both teams. Prior to turning professional, he tried his hand at baseball when he played first-base for a painters’ team in 1906. He also played in goal for the Royals soccer team in 1910 until amateur authorities objected. Marshall was also noted for being a championship bowler. During a tournament in the winter of 1923-24 bowling for the New Westminster Elks, ‘Buck’ took first place and set a provincial record, scoring a total of 713 from three games. In 1911 he was on a bowling team that won the trophy for Pacific Northwest champions. His highest score was reported in 1924 to be 268 with eight strikes and two splits. ‘Buck’ Marshall played in 131 games on the Pacific Coast and scored 12 goals and 14 points – numbers which probably make him the leading scorer amongst defensive pro players. He ranks fourth in career games played and led in penalty infractions with 59 – although his 321 penalty minutes place him in fifth amongst all Coast pro players. He appeared in 13 of the 14 professional seasons played on the Coast between 1909 and 1924; only one of three players, team-mates Cliff ‘Doughy’ Spring and James ‘Pat’ Feeney the other two, to play in as many seasons. 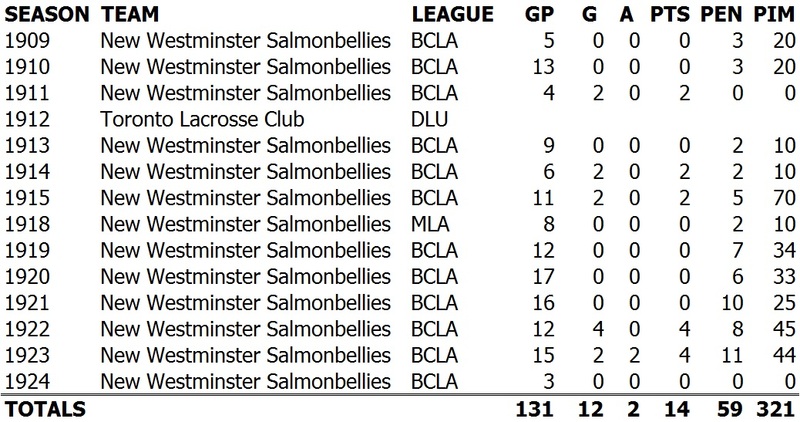 No player managed to suit up for all 14 pro seasons in British Columbia. His final match in professional lacrosse took place on May 28, 1924 and ended on a bad note: ‘Buck’ sat out the following game due to cracked ribs he had sustained – but never saw the playing field again, as the professional league folded less than a week later. 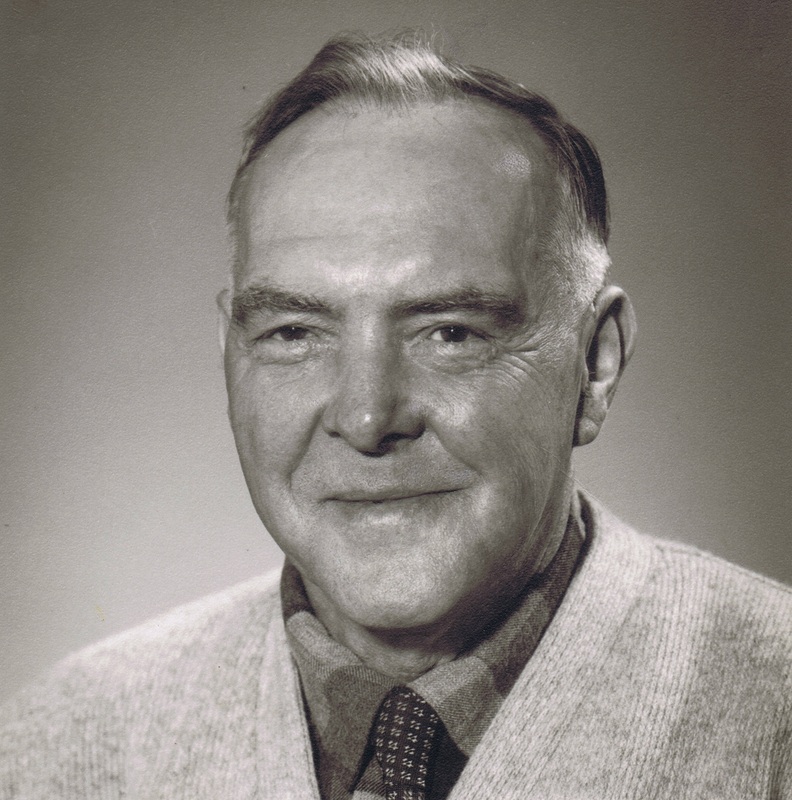 Dave ‘Buck’ Marshall was inducted into the Canadian Lacrosse Hall of Fame in 1967. He was born in Portage La Prairie, Manitoba in 1887 or 1888 and passed away on May 23, 1975.